A housing association contacted us requesting an End of tenancy cleaning service for one of their properties in Chelmsford, Essex. Before agreeing to taking on the cleaning, a set of pictures were sent to us so we can clearly see and understand the magnitude of the cleaning to be undertaken. With an extensive experience in end of tenancy cleaning, we have defiantly had our share of unkept properties, but we were certainly not expecting that.No wonder 10 other cleaning companies refused the job after the prearranged on site visit and at the first glimpse of a 15 inch rat. The condition of the property was politely said horrendous and unbearable plus the lack of both electricity and water added to the non existent the working conditions. Due to these circumstances, the professional cleaners had to wear protective personal equipment such as dust masks, glasses, hard ware gloves and even safety shoes. The house has become somewhat famous in the area as even a TV channel was interested in following and filming the cleaning progress. 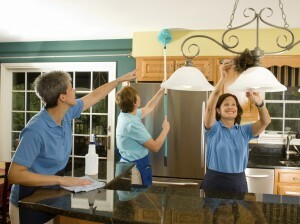 FastKlean cleaning company is pleased to report that cleaning was done to a complete satisfaction and our professional cleaners were generously rewarded by the client for their hard work. Since then, the housing association has requested another end of tenancy clean for a similar type property and we are currently in the process of developing a proposal which will reflect their specific needs.